The long-horned tick could establish itself across North America if transported accidentally, according to a new study. “Potential Spatial Distribution of the Newly Introduced Long-horned Tick, Haemaphysalis longicornis in North America” by Ram Raghavan, BSc, PG Diploma, MS, PhD, assistant professor at Kansas State University’s (KSU’s) College of Veterinary Medicine, addresses widespread concerns the tick could successfully build invasive populations in the U.S.
“The long-horned tick is also known as the east Asian tick, in Australia as the bush tick, and in New Zealand as the cattle tick,” said Dr. Raghavan. According to Raghavan, in some places (i.e. Australia and New Zealand), the tick is implicated in the transmission of theileriosis to cattle. Further, in other areas, it is known to transmit severe fever thrombocytopenia virus to humans. 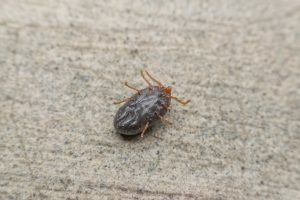 The study’s focus is to predict where this tick could establish in North America, and to do it as robustly as possible considering all the caveats in spatial distribution modeling. “By our model, we have identified vast areas of North America, particularly the southeastern U.S., the West Coast and broad areas of the northwestern U.S., as well as central and southern Mexico, as climatically suitable for establishment of this species,” Raghavan said. The long-horned tick can reproduce without males and can spread to new places and establish under diverse climatic conditions. “An invasion in the U.S. would carry a significant economic burden and potential human suffering, especially since this tick is capable of transmitting a variety of pathogens such as those causing Lyme disease and others,” said Steve Barker, BSc, PhD, one of the study’s 10 co-authors. The researchers also are concerned the ticks could travel as parasites on different mammals. “In our opinion, we feel there is a need for strict inspection and quarantine of cattle, other livestock, and pet animals, particularly dogs, about to be transported from the current focus areas of this tick,” Raghavan said. To read the study, published in Nature’s Scientific Report, click here. We have had cross border ‘rescue dogs’come into Alberta with attached ticks that went undetected prior to entry. With the number of animals that travel these days, thorough daily tick checks need to be performed.